In about a month, Illinois voters will head to the polls to choose the state’s next governor. The election has been dominated by two men with considerable resources to make their case why they deserve the state's top job: current Gov. Bruce Rauner, a Republican, and Democratic nominee JB Pritzker. Pritzker joins us to answer questions from 70 high school students who are part of the Mikva Challenge, a program that helps young people get involved in politics and community leadership. Rauner was invited and interested in participating, but campaign staff told us last week his schedule would not allow it. Students, teachers and Mikva Challenge coordinators arrived at WTTW on Monday afternoon for warm-up activities, lunch and discussion. Below, photos from the day. Meet some of the Mikva Challenge students below. Find out which issues are important to them and what they thought about Pritzker’s responses to their questions. 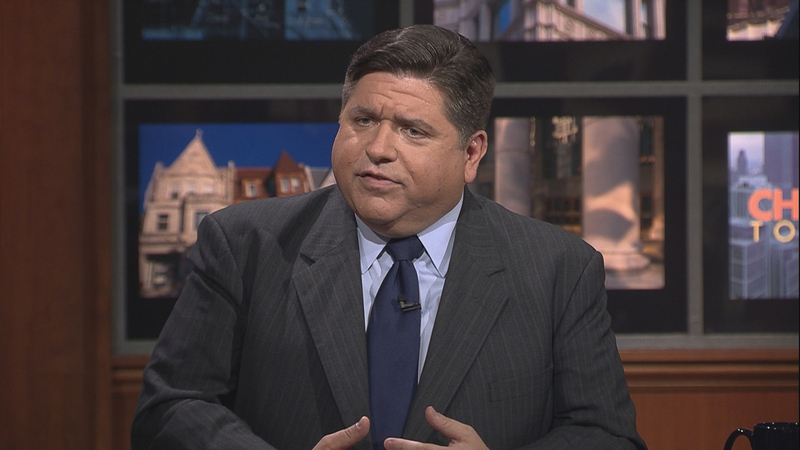 How did you feel Pritzker responded to your question regarding House Speaker Michael Madigan? His opinion on other leaders in Illinois’ government, I think, shows a judgment on his character and where he stands on issues. I think he addressed part of it, but like Amanda (Vinicky) pointed out he did not give an actual grade. He just said on the lower scale, which everyone can draw their own conclusion. But he didn’t give a definitive answer. Which issue is most important to you as a would-be voter? The candidate’s position on education because we do attend school, and CPS is very underfunded, specifically Taft High School is super overcrowded and so are most of our other high schools in Chicago. And we don’t have enough resources allocated for the amount of students we do have. It’s important to me to have a governor who would be able to take care of those issues, and at least start the process of addressing them and how we can fix it. How did you feel Pritzker responded to your question regarding his wealth? I really did like his response. We were all joking that he was going to talk about what he does in his free time, but I actually really did like his answer and how his wealth doesn’t change his views and he doesn’t view himself as better than anybody. He kind of wants to use that wealth to benefit people, especially people of color (and) people who actually need it. Representation and (a candidate’s) position on abortion because I am a feminist and women’s rights are very important to me. How did you feel Pritzker responded to your question? I found it very important – his plan of action for implementing the many things he has in mind for Illinois, especially since many things have not been resolved under Bruce Rauner’s administration. I thought it was very important to see how he’s going to pull in all the Illinois voters, along with the rest of the citizens. And to see how he’s going to bring everyone together and unite and agree to big changes that are going to happen. … I hope his actions speak louder than his words today. Education because I’m a student who’s very dedicated and finds my education very crucial, especially for my future. As someone who comes from a family that will most likely be the first college graduate of my generation and I would definitely love to see if (Pritzker) can bring reforms to our system. How did you feel Pritzker responded to your question about why he chose to run for governor? He gave a pretty solid answer to my question. His experiences in lobbying and working with others to get things through in Illinois pretty adequately (showed) political experience – though I was a little bit disappointed that he didn’t address as much like why he didn’t start at a smaller state position. Moving forward and actually getting legislation passed in the state of Illinois. Over the last four years, we’ve had a governor who has struggled to get legislation through, to even pass a budget. I just don’t think that’s adequate. The most important thing as a voter would be to actually work with the other politicians in the state of Illinois to accomplish tasks. How did you feel Pritzker responded to your question about the Jason Van Dyke verdict? I liked his answer. He didn’t just talk about Chicago specifically, but he talked about police training as a whole. This problem doesn’t just happen in Chicago. It may be more prominent and that’s what the issue is right now, but it doesn’t just happen in Chicago, and I really think that he understood the question. I think he felt like police should have reform. Education because in Chicago a lot of schools are being closed down because of lack of funding. I have younger siblings, so right now I’m going into college and I’m looking at them, like are they going to have the resources to succeed? I really think that education is an important topic. He answered within reason. He wasn’t ignorant to the fact that he could lose. Chicago’s safety and the CPD has to work on their training.